When and how to change the correctly recorded file? As you repair your broken file with MP4Fix, the App chooses for you a correctly recorded file implicitly. Don’t change it at first. Nevertheless, if fixed video doesn’t look good in Preview, you should change the correctly recorded video manually. 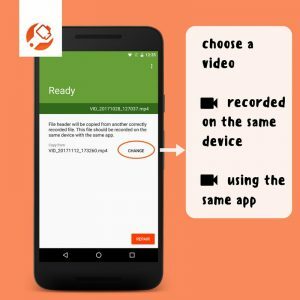 As the correctly recorded video choose the file correctly recorded on the same device using the same app (same version and settings) as the broken one. It is not important how long is the file and what is recorded. The correctly recorded video will not be broken or changed by MP4Fix. Read Broken mp4 – learn about reasons and find solution if you would like to understand why the correctly recorded file is necessary to repair a broken video with MP4Fix. What if you don’t have the correctly recorded video? Please read: I don’t have the correctly recorded video. Will MP4Fix work?